The OASE Filtral UVC Premium are compact all-in-one submersible pond filters with integrated ultraviolet lights, ideal for Goldfish ponds. 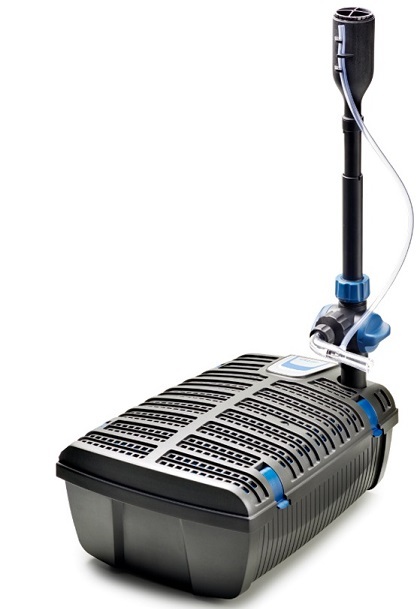 Each OASE Filtral combines a solids handling pump, an ultraviolet clarifier (UVC) for eliminating pathogens and single cell algae and a highly effective multimedia filter for mechanical and biological water cleansing. A single electrical connection is required for these compact and efficient underwater pond water cleaners which can also feed a small watercourse and/or pond fountain. The OASE Filtral UVC Premium. A discreet, energy efficient solution to small pond filtration. The OASE Filtral UVC Premium are a range of 4 all-in-one submersible pond filtration units for wildlife ponds up to 9,000 litres, or ponds with a Goldfish stock up to 4,500 litres. Filtral UVC filters sit on the floor of the pond, circulating the water quietly and discreetly without the need for pipe connections. The Filtral can also be vertically mounted to the walls of non-lined ponds by screwing though the designated positions on the inside of the bottom casing. The integral filtration pump pulls water through the perforated lid of the filter, down through the filtration media and discharges filtered water out of the top outlet via the ultraviolet clarifier which prevents the water from turning green. The ultraviolet light is horizontally mounted with a top viewing window which protrudes from the lid, making it very obvious that the UV is on and functional. UV power ranges from 5 watts to 13 watts across the range. The filtration foam media consists of a large, coarse blue filter foam which spans the entirety or the suction area, collecting solid waste product as it is pulled into the filter without restricting flow. Beneath the large blue filter foam is a secondary fine, red filter foam which helps to collect any smaller particle matter that has passed beyond the coarse foam. The hollowed, cylindrical ceramic media and moving biological elements provide plentiful housing for microorganisms which break down soluble waste product. The clean water outlet of the filter can be converted into a water supply for a stream by simply attaching a hose pipe, or a decorative water fountain by using the OASE Filtral Premium Fountain Kit which is a specially designed fountain adaptation kit. The Filtral Fountain Nozzle Kit is supplied with 3 fountain patterns, a flow adjuster and a telescopic fountain riser pipe for height adaptation and angle adjustment. 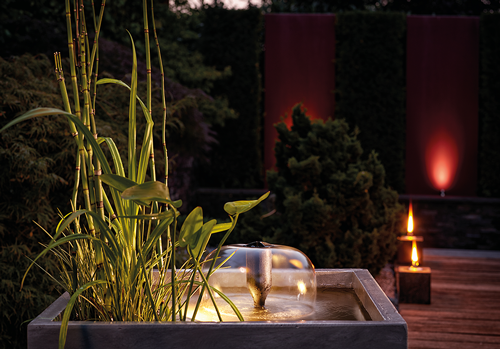 This fountain addition is available to purchase as an optional accessory. An optional OASE Filtral Aeration Set can also be bought and used alongside the Filtral Fountain Nozzle Kit. This venturi attachment uses a piece of flexible air hose fixed above the water surface by the fountain head, pulling oxygen down to an air injector extending from the riser which blows oxygenated water into the pond. This attachment is particularly beneficial if the pond contains fish. The lid locking clips keep the top of the filter firmly secured and make for easy access to the internal components. 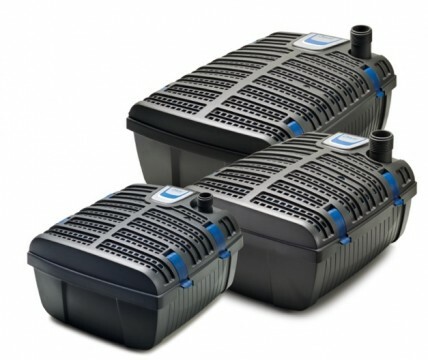 The lid design also allows for the top of the filter to be removed without having to remove the outlet connection, be it a hose pipe or fountain attachment. OASE Filtral UVC units are very simple to install and easy to maintain also. These all-in-one units only require a single power connection and are supplied with a 10 metre power cable.